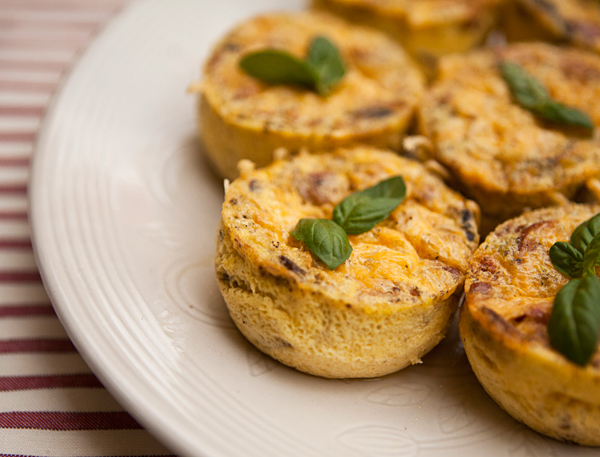 I have been making these mini quiches in muffin cups for years. I usually make a tray of them for myself and once cooked, I freeze half and heat them up for breakfast when I need something quick, easy and tasty. They are also great on a brunch table and are very versatile too! You can add any vegetables you like, any type of breakfast meat such as sausage, bacon, and any melting cheese you have in your refrigerator. You can also use whole eggs. half eggs and half egg whites, or even an egg substitute as I have in this recipe. I used turkey sausage in this version along with some sautéed mushrooms and reduced fat cheddar cheese. 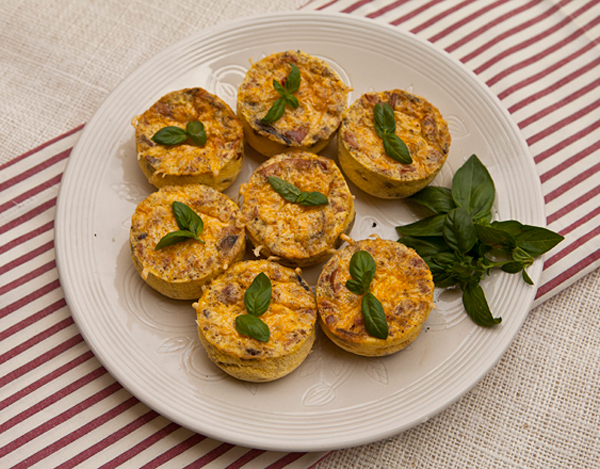 The egg cups or mini quiche can be wrapped and stored in the refrigerator for up to three days, or frozen up to one month. To reheat, remove the plastic, wrap the quiche in a paper towel and microwave for 30 to 60 seconds. Mushrooms contain important nutrients, including selenium, potassium, riboflavin, niacin, vitamin D and more. Using turkey sausage and reduced fat cheddar cheese eliminates many of the calories from fat. By using Egg Beaters, the yolk are eliminated, therefore 1/2 of the calories from fat are cut out. In addition, it contains greater amounts of important vitamins such as A, B-12, D, and E, as well as other essential nutrients such as folic acid and riboflavin. Each serving of Egg Beaters also has 5 g of protein. These easy egg cups or mini quiche can be made with many different flavorings. Preheat oven to 325 degrees F and lightly oil (or use olive oil spray) a 12 hole muffin tin. Heat the oil in a frying pan and cook the sausage meat until lightly browned and cooked through, about 6 to 8 minutes. Transfer to a bowl and cool. Add the mushrooms, and cook until golden brown, about 5 to 7 minutes. Transfer the mushrooms to the bowl with the turkey sausage and cool 5 minutes, then add the chopped onions and season with salt and pepper. Whisk together the egg substitute (or whole eggs) and milk, and season with salt and pepper. Pour the egg mixture, divided evenly between the prepared muffin cups, then add a heaping tablespoon of the sausage mixture on top. Sprinkle the cheese on top of each of the mini quiche and then bake until the eggs are set and beginning to brown, about 25 minutes. Cool for 5 minutes, then turn out onto a platter and cool completely. This looks amazing, can you please tell me if it is suitable to freeze? If so, would you cook it first then freeze? Many thanks. Meredith, yes it should freeze fine. I would freeze it before baking.